Kalama® VITROFLEX® B by Emerald Performance Materials is a blend of dibenzoates. Acts as a plasticizer. Designed especially for B-side component of two component polysulfide sealants. It imparts good rheology for suspension stability of dispersed solids, elasticity, fast cure rates and hardness development. 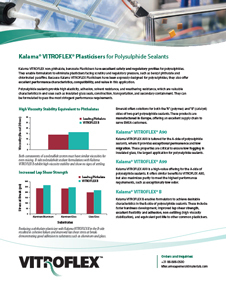 Kalama® VITROFLEX® B may be useful in plastisol applications like seam seals. It is listed under FDA 21 CFR 176.105. Complies with REACH, DSL, IECSC, EINECS, ELINCS, NLP and TSCA.